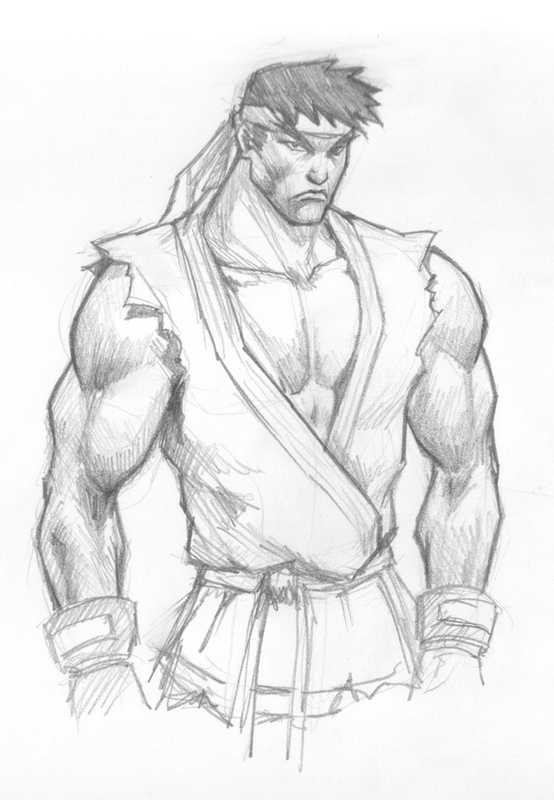 How to draw Ryu from Street Fighter. Learn how to Draw and Sketch comics character, male hero character Ryu from Street Fighter. Learn from Step by step and video tutorial. Drawing and sketching step by step: male character design for manga, video game, and comics basic. The process shows BASIC drawing and sketching video series of comic book characters that will help you gain knowledge of anatomy and dynamics in the positioning of the figure and the details. Ryu is a fictional character and one of the most popular fictional characters from Capcom. Ryu debuted in the first Street Fighter as the primary playable character in the game, with his best friend, rival and sparring partner Ken serving as the second player's character. He and his rival Ken (who both trained under the same master, a character later established to be Gouken) compete in the tournament depicted in the game in order to test their strength against the tournament's champion, Sagat. His next appearance was in 1991's Street Fighter II. Set several years after Ryu defeated Sagat in the first tournament, Ryu participates in a second tournament, inviting his old friend Ken to compete against him. In his ending in the game, Ryu wins the tournament against Sagat and M. Bison, but does not stay for the ceremony, already seeking his next challenge and leaving the player with the quote "The Fight Is Everything". This ending defines Ryu's characterization as a "wandering warrior". Learn to draw comic book characters with tips from a professional concept artist and illustrator Xia Taptara. Below is a video tutorial how to draw Ryu from Street Fighter.